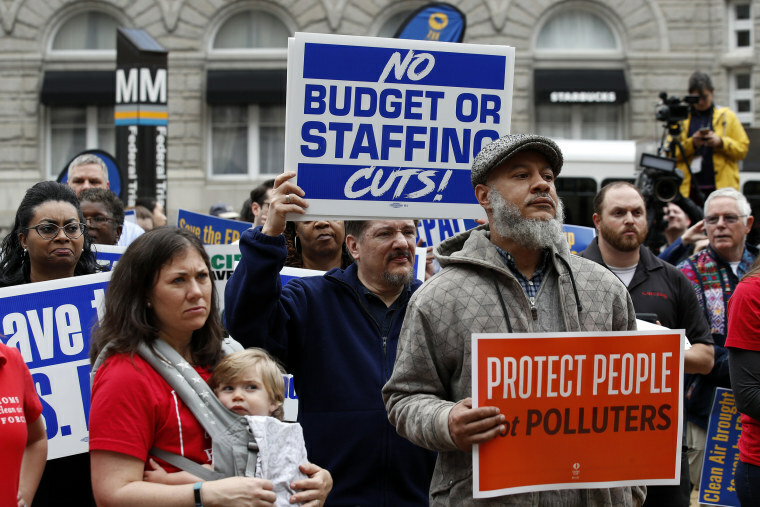 The new rules make it easier for the government to fire federal employees. WASHINGTON — President Donald Trump began fulfilling a promise to facilitate the firing of federal workers Friday, quietly signing a set of executive orders to rewrite the government's employment rules. The three actions, two of which crack down on federal employee unions, are designed to "make it easier for agencies to remove poor-performing employees and ensure that taxpayer dollars are more efficiently used," Andrew Bremberg, director of the White House Domestic Policy Council, told reporters. In his State of the Union address in January, Trump asked Congress to give Cabinet secretaries more power over the employees of their agencies. Even though, as president, he has tended to avoid firing top officials face to face — and these moves will certainly affect less high-profile cases — the president who made a name for himself by saying "you're fired" contestants on his TV show "The Apprentice" has often spoken publicly about his desire to fire, and exultation in firing, well-known employees who aren't doing his bidding. For example, when FBI Deputy Director Andrew McCabe was removed from his post earlier this year, Trump called it "a great day for democracy." He fired former FBI Director James Comey and has mused about getting rid of many of his Cabinet secretaries, including Attorney General Jeff Sessions. The first of the three orders directs the Office of Personnel Management to revise existing rules so that the time an employee under review has to show improved performance is reduced from a 60-to-120 day window to 30 days. The second requires federal agencies to renegotiate union contracts with an eye toward cost savings, according to senior administration officials. And the third is designed to reduce the amount of time federal workers can spend on union business, the officials said on a conference call with reporters. It aims to limit the non-agency work of federal employees to 25 percent of their time and prevent taxpayers from subsidizing appeals lodged by unionized workers and activities the administration said amount to "lobbying" by federal workers who are in unions. "Federal employees will no longer be allowed to lobby Congress while in a paid-duty status, unless they're doing it as a part of, say, legislative affairs or their official duties," a senior administration official said. It is already illegal for White House and agency employees to use appropriated funds to lobby Congress, even if they work in legislative affairs offices. But a White House official said that the Federal Labor Relations Authority has ruled that "lobbying on union time" is not prohibited by anti-lobbying laws. In effect, the new rule could make it harder for federal workers to discuss policy and employment issues with lawmakers and their staffs. Lee Saunders, president of the American Federation of State, County and Municipal Employees, slammed the executive orders.